Need a Handyman in Maryland? We Can Help! Not so handy yourself? Don’t fret – we are! Owning your own home is exciting, but being a homeowner doesn’t magically turn you into a professional handyman. It can be motivating to try to fix problems within your home yourself, but without experience, you may make matters worse and cause even costlier damage. If you are a homeowner who is renting out your space, your tenants are going to turn to you for help with both major and minor services. Either way, if you need a handyman in Maryland – Atlantic Maintenance Group is your solution. Whether you need a minor repair or a major renovation, our expert staff at AMG can work with you to solve your problems and make your home a safer place. We offer unparalleled service and will check back in post-service to ensure that you are happy with our work. There is no job too small or too large for us to handle, and we make an effort to perform all our services in a fashion that has minimal impact on your daily life or your tenants. 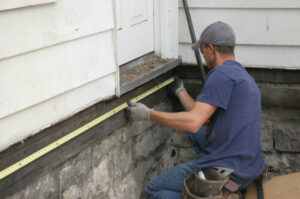 We offer the following general contracting and handyman services. Caulking may seem like an easy task at first, but hiring a professional to perform caulking services for you is the best way to ensure the long-term success of the job. Caulking (both interior and exterior) can protect your property from pesky water leaks, chilling drafts, and pest invasions. We can help you keep your roof in healthy shape before small repairs lead to major costly damage. We can inspect your roof for leaks and other damages and patch or repair them in a timely fashion, extending the life of your roof. If your roof is beyond help, we can also do a full roof replacement. Unsightly, overflowing gutters can cause damage to the foundation of your home and drastically reduce your curb appeal. We can address gutter clogs, warps, and leaks that are causing moisture damage and attracting pests. We can clean your gutters or even custom cut and install seamless gutters on site! What Else Can Your Handyman in Maryland Do? In addition to the services we’ve discussed, we can also provide the following: carpentry repairs, tenant renovation and demolition, siding repair or installation, exterior and interior painting, wallcoverings, drywall repairs, drywall installation, landscape maintenance, and power washing. This entry was posted on Friday, May 13th, 2016	at 4:36 pm	and is filed under Blog, Home Repair	. You can follow any responses to this entry through the RSS 2.0	feed. Both comments and pings are currently closed.